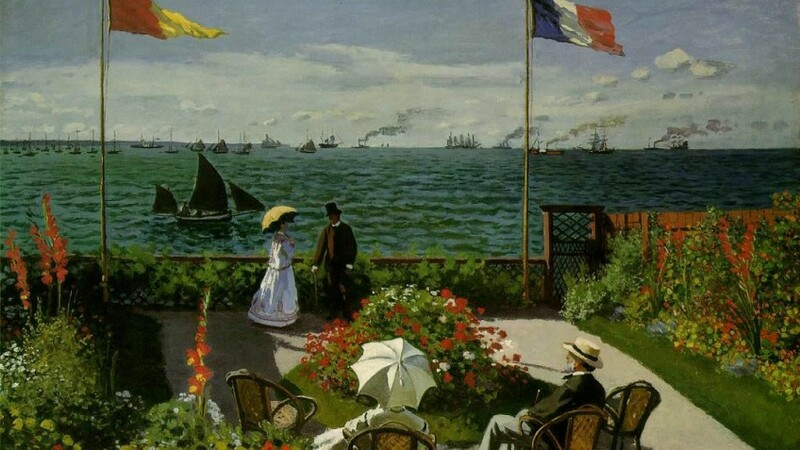 Monet’s early painting, Garden at Sainte-Adresse, has been so often reproduced that it is familiar to most anyone with even a fleeting interest in art. But, as is invariably the case, reproductions can only hint at the sensual and tactile pleasures of viewing the original, owned by the Metropolitan Museum of Art and included in this splendid exhibit that focuses on Monet’s Normandy paintings. At the time of the painting, Sainte-Adresse was a vacation haven for the wealthy who built villas to take advantage of the water views. In the painting, a series of horizontal layers (sky, clouds, water, garden) is countered by the strong verticals of two flagpoles. Two elegantly dressed couples enjoy both the rich colors of the garden and the water view with sailboats and steamers dotting the horizon. There’s a lot going on in this painting, but, for all its complexity, the composition is so assured, the colors so luminous, and the subject matter so beguiling that it inevitably elicits a response of pure joy, no matter how often viewed. Monet (1840-1926) spent time throughout his career in various Normandy locations and Monet in Normandy provides a wealth of geographical information along with the paintings from such places as Trouville, Rouen and Giverny. While the documentation of place surely is useful, art lovers will find that, since the exhibit temporally includes most of the artist’s working years, it is a sort of sneak retrospective. From Garden at Sainte-Adresse (1867) to the water lily paintings of the 1920’s, Monet moves from the more traditional, three-dimensional perspective of realism (influenced by Millet and Courbet) into flattened perspectives (influenced by Japanese prints), the abstraction that evolved out of the Impressionist concern with capturing the quality of light, and an ever-increasing awareness of the brush stroke. Brushstroke capturing the play of light and shadow continued to challenge Monet, even as he reached the culmination of his series paintings in the masterful water lilies from the turn of the century into the 1920s. In 1883, the painter created a lily pond on his Giverny property; he later expanded the pond and continued to develop the surrounding gardens.In the paintings, he continued to pare away all but the essentials of color and light until what remained were nearly fully abstracted impressions of the shimmering beauty of the controlled nature of his exotic gardens. On these works, curator Lynn Orr concludes: "Their subtly abstracted motifs and delicate tonal surfaces bespeak the soothing properties of nature. As such they are the summation of the artist’s intimate relationship with the natural world. Monet’s profound understanding of and ability to convey nature’s ineffable gifts proceeded from a life spent out of doors watching, listening, and absorbing the visual lessons that the landscape of Normandy offered."